MINISIS Inc. is a social entrepreneurial company providing the complete MINISIS line of products and related services. Given its 40 years of history, the next generation of MINISIS will ensure that the software continues to develop and serve a wider audience. This audience includes both developed and developing countries, and private, governmental, and NGO/Educational institutions. In addition, with the development of our management consulting disciplines, we now possess more expertise with Business Process Reengineering (BPR), Change Management, Application Analysis, and Design, and expertise with the complete System Development Life Cycle (SDLC). This approach enables MINISIS Inc. to offer total solutions from upfront strategic planning services to determine requirements, JADS analysis, application development, implementation plans, and training and documentation services along with the core MINISIS products. MINISIS Inc. is a multinational corporation headquartered in Vancouver, BC, with regional offices in Ontario, Tunisia, and Trinidad and Tobago. MINISIS has existed since 1975 and is continually growing and expanding worldwide. MINISIS Inc. is a profitable software house fully insured with both professional liability and general indemnity coverage as well as escrow agreements. MINISIS prides itself on its diverse employee, supplier, and client base. We support social, cultural, and ethnic diversity in a framework of tolerance and acceptance. It is the belief of MINISIS Inc. that clients care about the ethical decisions in which their suppliers engage. To that end, MINISIS Inc.’s doors are always open to any client to test our accessibility and integrity. MINISIS Inc. is not just another software developer — it is “Technology with heart and understanding”, the new breed of social entrepreneurial companies. MINISIS software has been implemented in over 70 countries since our beginnings in the 1970s. We are a progressive organization that is compliant with employment equity legislation (including our own Employment Equality Statement derived by the employees themselves), covered with $4,000,000 dollars of errors/omission and professional liability insurance. As well, MINISIS Inc. is a company that is more concerned with access to our technology than worrying about profit margins. We price our software based on geographic or country type/locale. Further discounts are provided to organizations which suffer from chronic under-funding (such as developing countries, Universities, NGOs and education/research entities). This philosophy along with our suite of software has placed MINISIS Inc. on the international map as a unique multinational corporation that has a heart and understands that through technological innovation, you still need to encourage accessibility. As a social entrepreneurial company, our goal is focused on the key principal of accessible and affordable technology for all. We are able to achieve great technological advancement by focusing on our clients rather than the latest fads. From our humble beginnings underneath the maples in Ottawa, then on to Valencia with its famous oranges, to the sands and beaches of Tunisia, and finally the glorious mountains of Vancouver, the staff includes a wide range of individuals from different religious, cultural, national, and ethnic backgrounds. The average years of expertise per resource in our company is 15, and covers expertise from programming to solid business analysts and documentation coordinators. 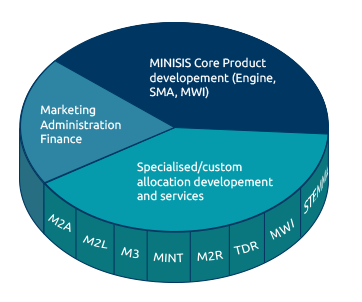 The majority of MINISIS Inc’s resources are distributed evenly between our core product line and the pre-defined applications, while only 20% of our resources are allocated for administration, marketing, and general business processes. Our goal is to focus on being technological innovators, free from mass marketing and overpriced solutions.